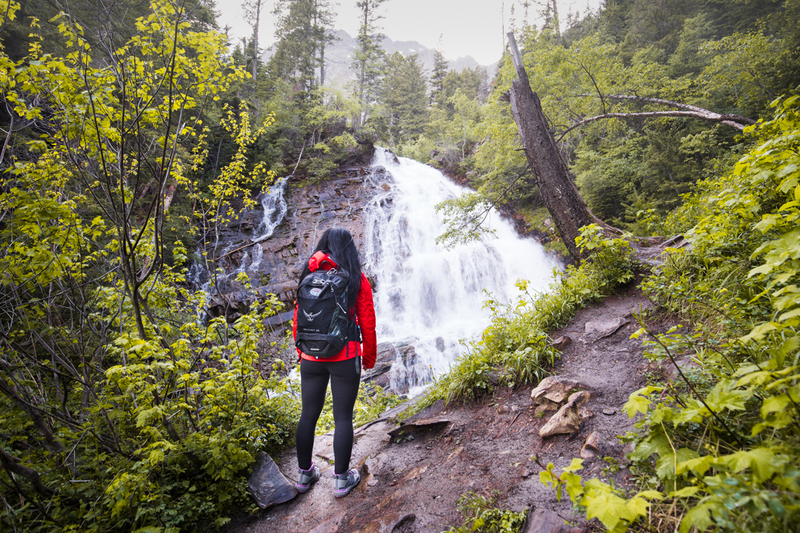 Named after an early resident of Waterton, Bertha Ekelund, the Bertha-series of hikes provides the perfect trifecta to challenge your hiking abilities. Beginning with Bertha Falls, progressing through Bertha Lake and culminating at Bertha Peak, there is a hike to both suit and challenge the needs of all; from basic beginnings to scrambling summits. 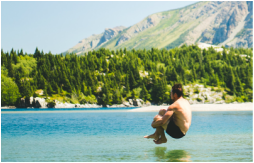 This is an immensely popular hike in Waterton and a great trail for first-time hikers, families or anyone just simply looking for a casual outing. Once on the trail, it is extremely well-defined and well-traveled. It.includes a number of viewpoints and even intermittent benches for those who want to take a seated break. In terms of testing your hiking prowess, this is an easy one. The gradual elevation gain is minimal, at just 175m over 2.6kms, but it’s going to require more effort than just a flat hike. The trail itself is mostly smooth, but you will be required to navigate a few minor rocky sections. All in all, Lower Bertha Falls is a great starting place in your hiking hierarchy and will reward your efforts with an amazing up-close view of Lower Bertha Falls. Bertha Lake is a continuation of the Lower Bertha Falls trail, and also where you will get your introduction to hiking up elevations. Hiking on an upward slope is nothing like hiking across flat terrain. You will be engaging more muscle, and therefore more energy and more oxygen. In other words, you’re going to feel it in your legs and lungs. The start of the moderate 460m elevation gain is encountered immediately once you pass Lower Bertha Falls. ​Luckily however, hikers are treated to a series of wide switchbacks that lessen the intensity required. break the crest of the trail and be descending a short way down until beautiful Bertha Lake comes into full view. Making it past the falls and to the lake means you did it. Additional Info: Scrambling. Loose scree. Water haul required. Admittedly, the jump from the moderate Bertha Lake to that of the difficult Bertha Peak is a big one. You will be hiking around the perimeter of Bertha Lake and then up to the top of one of the mountains that surrounds it. And to do so, you will need to employ a number of advanced hiking techniques. First off, you’ll need to be comfortable with scrambling (using both your feet and hands as points of contact to ascend vertical rock sections). and a second that only involves minimal scrambling. Either way, there will be scrambling. Next up is route-finding, or more bluntly, there isn’t a pretty trail for you to follow. The direction of travel is very loosely marked with the odd orange ribbon on a tree and a few rock cairns here and there. ​But you’ll need to feel comfortable in figuring out how to get from Point A to Point B on your own. You have a really good line-of-sight to both the peak and the lake on this one, so a wrong turn won’t get you lost in the woods, but it might cause you to have to backtrack and lose time. Speaking of the woods, be prepared to have to bushwack through them on your return hike to the lake. through bushes and deadfall to get back to the trail, myself included. Lastly is physical fitness, as in, you’re going to need a fairly decent level of it. Most everyone is familiar with The Bears Hump hike in Waterton. The addition of Bertha Peak to the Bertha Lake hike isn’t a big one in terms of distance; but you’re adding almost 700m in elevation, so it’s steep. camp at Bertha Lake and try your hand at Bertha Peak the following day. 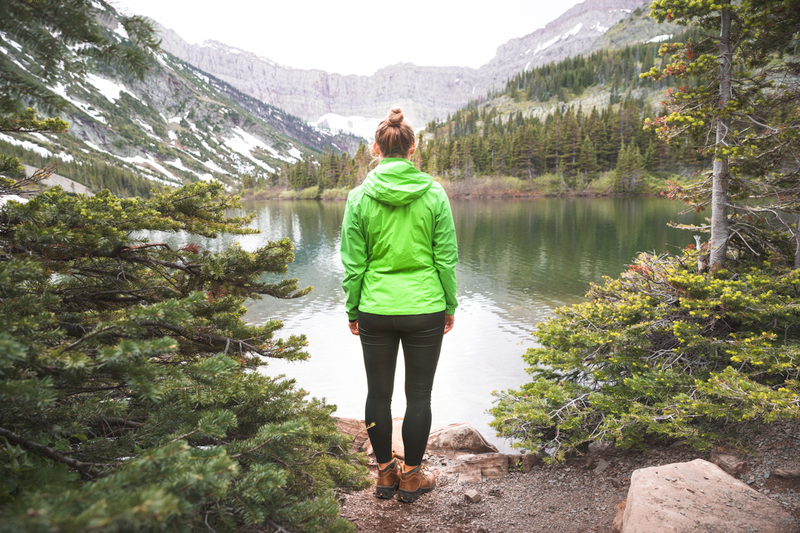 Whichever you chose, expect to dedicate the better part of your day to this hike. Though it may sound like a fair bit of work to most, you can’t truly appreciate Bertha Lake in all of its breathtaking beauty until you have seen it from above. In the end, the rating doesn’t matter, only the experience does. The vast majority of people will be quite content with hiking to Bertha Falls, and will love every peaceful minute of it, as they should. are those who are looking for the “What’s Next?” in the hiking equation. to see if you’re ready for it.